Prioritization is a challenge. A typical product wishlist far exceeds the product team capacity. Choosing wisely makes a big difference in product and ultimately business success. Product wishlist items are collected using a variety of sources and techniques. They come from customers and internal stakeholders and are gathered using brainstorming sessions, interviews, online feedback capture, focus groups, analysis of sales win/loss reports and support cases, competitive analysis etc. Wishlist is constantly evolving with frequent additions of new items. Different stakeholders commonly have varying perspectives on the top priorities. The process we have used to determine top priorities starts with scoring (the science part). All items are scored in two dimensions: business value and cost/complexity. Items which are high value and low complexity (Quick Wins) are a no brainer and after a sanity check automatically become a priority. Items which are low value and high complexity make for an equally easy decision and are disqualified. Now comes the arts part. Items of high value and high complexity is where the key decisions have to be made. Scoring is a rather imprecise tool so simply using scores to drive decisions would not result in an optimal decision. Top items from the Strategic quadrant are instead selected in a working session involving key stakeholders where their respective merits are debated and ultimately voted on. Start with the business goals and key themes among customer requests. Translate these into product goals. Define scoring criteria. Value scores are based on alignment with the product goals. Cost/complexity scores are based on rough engineering estimates. Score wishlist and place all items on the 2 x 2 board. Sanity check Quick Wins and Disqualified items. 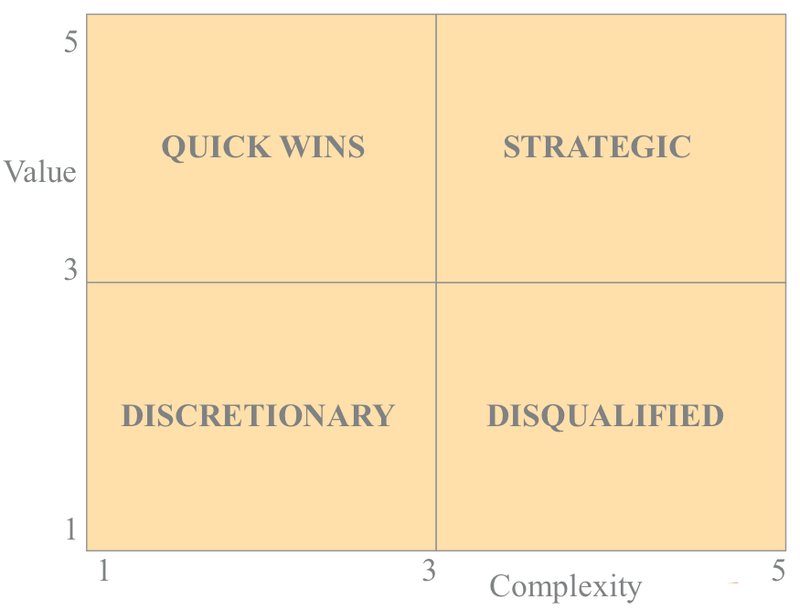 Debate and select top items from the Strategic quadrant. Steps 6 through 8 above are done is a working session with the key stakeholders. The entire process is repeated every 6-7 weeks, or at a minimum once a quarter.